Aside from stays, my 1780s round gown will need some more undergarments. A shift, false rump, and at least two petticoats. I’ve got the grey linen petticoat I wore under my 1660s gown, but the rest still required making. As of this weekend, however, I now also have a false rump. 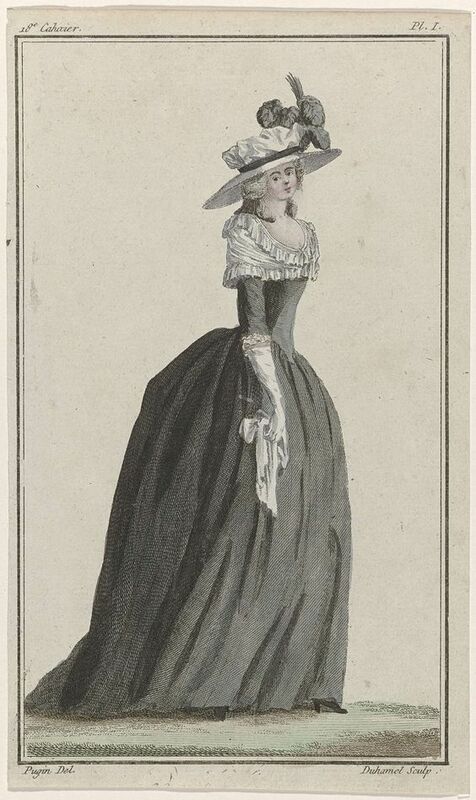 As this fashion plate shows, skirts grew round later in the century, and could be quite big. A shape like this requires a little more help than just petticoats (although those are definitely crucial as well!). Enter: the false bum. Whereas the typical wide silhouette of the 18th century was mostly achieved through hoops, this round shape was probably the result of strategically shaped ‘pillows’. This prent is wonderful, as it also gives shapes. The size is very probably ofer the top, but it does show several different types of false rumps. 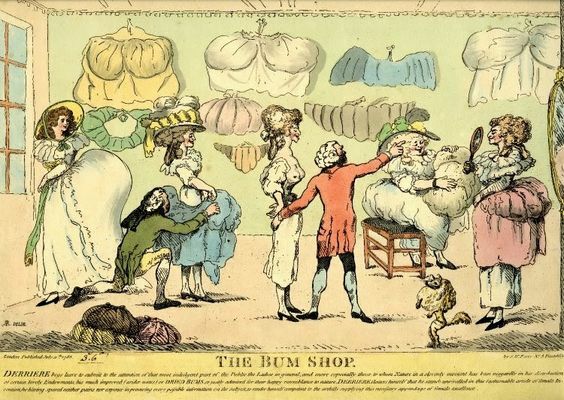 For my 1780’s dress, I wanted what is termed a ‘split rump’, so one with a bit of a ‘gap’ in the middle. 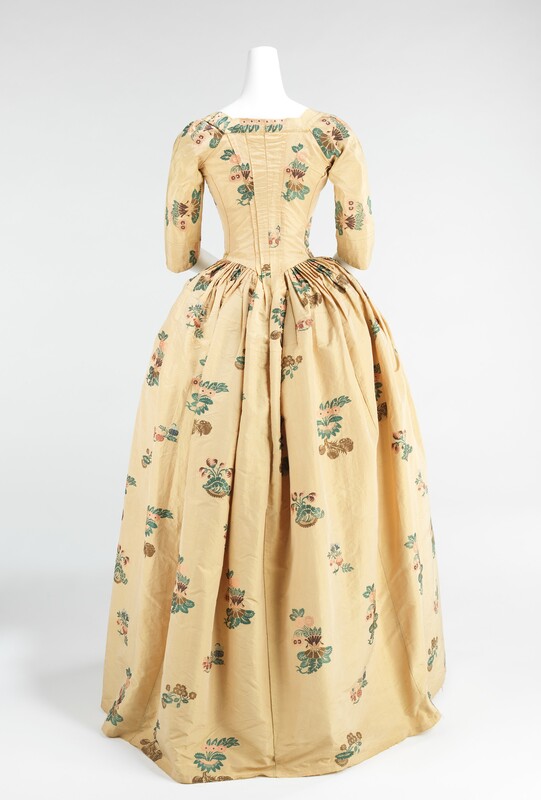 This gap allows the typical low back point of the 1780’s fitted back dresses to lie nicely against the body. I know of this type of false rump thanks to the American Duchess guide to 18th century dress making (book), which includes the pattern for one in their chapter on the Italian gown. However, in their version the two ‘cushions’ lie rather far apart, allowing the skirt to ‘dip’ between them a relatively far down. I wanted my split rump to be just a little more subtle, which is purely a case of personal preference. So I took inspiration from the satirical prent above, and slightly adapted the AD pattern to be a bit more ’round’, so the edges touch more. The split rumps at the top row on the satirical plate were the shape I was going for. I kept the ‘skirt’ beneath the cushions as in the AD book, and also followed their instructions for making it up (I sewed it by machine though, and filled it with modern stuffing). I also made sure that though I changed the shape and size of the cushions, the total hip circumference is the same as adviced, which was 2x the waist measurement. My pattern is both a bit longer, and wider than the original. To make sure the shape wouldn’t become too big, I made two stitching lines in each pillow, limiting how much stuffing could go in. And the finished thing! As you can see, there’s a small gap between the pillows, but it is quite subtle. And what it looks like with a petticoat on top! I’ll want at least one more, and then the dress will go over as well. This will round it off a bit more. And what it looks like from the side and front!